Background: Androgenetic alopecia (AGA) is the most common form of hair loss in adults, which is generally progressive in the absence of treatment. As a head full of healthy hair adds to the cosmetic appeal of the individual, the consequences of AGA are predominantly psychological. Currently, topical minoxidil is the first-line treatment for AGA. Many adjuvant treatment modalities have been used synergistically with minoxidil. Microneedling is one among such adjuvant treatments, which works by various mechanisms to stimulate the dermal papillary cells that play a key role in hair growth. Aim: To compare the efficacy of microneedling along with topical minoxidil and topical minoxidil alone in the treatment of AGA in men. Materials and Methods: Sixty-eight men with Norwood–Hamilton grade III and IV AGA were recruited for the study. After randomization, one group was treated with weekly microneedling and twice daily application of 5% minoxidil solution and the other group was treated with twice daily application of 5% minoxidil solution alone. Global photographs were taken at baseline (pretreatment) and at end of the study duration. Trichoscopic images were taken from a targeted fixed area before treatment (baseline) and at end of the therapy from where hair count was also carried out. The two primary efficacy parameters were assessed: increase in the hair count from that of the baseline and patient self-assessment of hair growth at the end of the study. Results: The mean increase in hair count in the targeted area of one square inch at the end of the treatment was significantly greater for the combination treatment group (12.52/inch2) compared to that for the minoxidil alone group (1.89/inch2). Four patients in the “microneedling plus topical minoxidil” group reported a 50% improvement versus none in the “minoxidil alone” group. Conclusion: Our study showed that the combination of microneedling and topical minoxidil treatment was superior compared to topical minoxidil alone with regard to increase in the hair count and patient satisfaction, although the response achieved was not cosmetically significant. Our study was a hospital-based, prospective, single-observer blinded study conducted between November 2015 and May 2017. Sixty-eight male patients with AGA were recruited for the study. Age matched (± 5 years) male patients of age group 18–40 years with Norwood–Hamilton grade III and IV AGA were enrolled for the study. Thirty-four patients each were randomly enrolled into minoxidil alone and the combination groups. Patients with a history of bleeding disorders and anticoagulant treatment, active infections, any regional dermatoses, and personal or family history of keloid were excluded. Detailed history with respect to the onset and duration of hair loss and preexisting medical conditions were recorded. 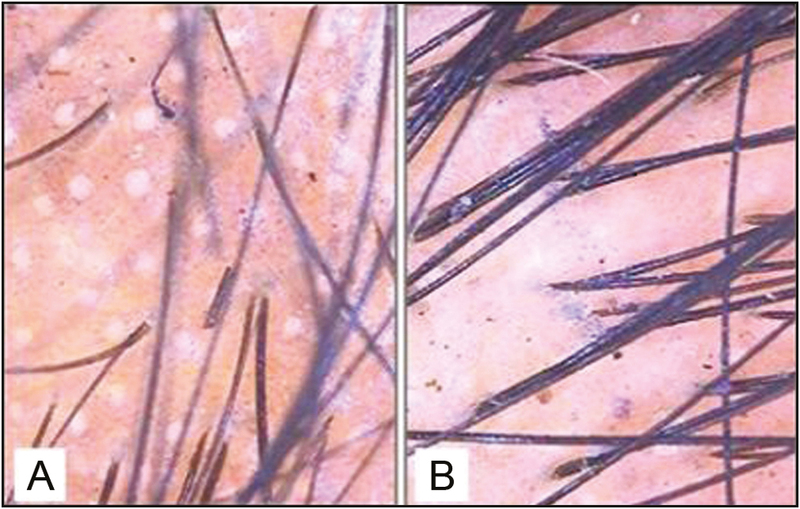 Initial clinical examination of the patient was carried out by one of the investigators to determine the grade of hair loss using Norwood–Hamilton classification. Informed consent was obtained from all the patients. Sixty-eight cases of grade III and IV AGA were allocated randomly into the “microneedling plus topical minoxidil” (N = 34) and the “minoxidil alone” (N = 34) groups. Each patient in either of the groups was studied for 12 weeks. Patients in the “microneedling plus topical minoxidil” group were offered microneedling treatment (weekly for four sessions initially, and thereafter, fortnightly for subsequent four sessions, covering the total duration of 12 weeks) along with 1mL of 5% minoxidil solution applied twice daily. Patients in the “minoxidil alone” group were advised application of 5% minoxidil solution 1mL twice daily for 12 weeks. Baseline (pretreatment) clinical and trichoscopy images were taken. Posttreatment clinical and trichoscopic photographs were taken at the end of 12 weeks. 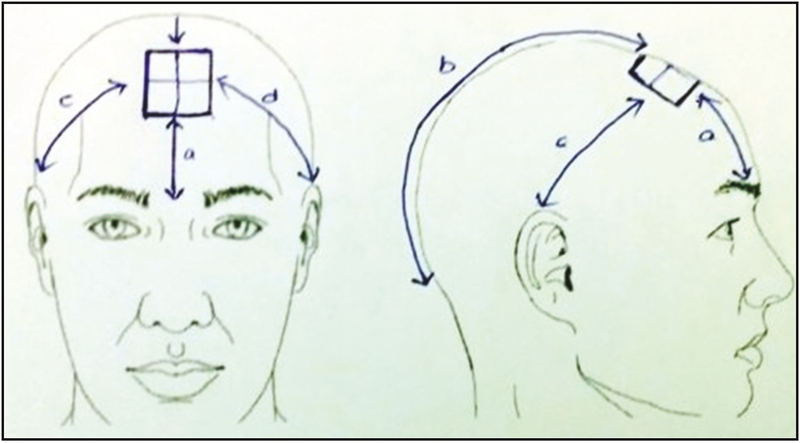 For recording the hair count, one square inch area with thinning of hair on the vertex was selected for each patient. The distance of this area from all sides (anteriorly from glabella, posteriorly from occiput, and laterally from the tips of both the ear helices) was measured and recorded in pro forma for reproducing during follow-up. This area was defined and marked using a skin-marking pencil at baseline and again during follow-up. This area was divided into four equal quadrants by a vertical and a horizontal line [Figure 1]. Digital images were taken from each quadrant separately using the video dermoscope (Ultracam TLS; Dermaindia, Chennai, India) at baseline and at the end of 12 weeks was the study period. Hair count was carried out by two investigators on a computer screen on both the occasions. A derma roller of needle length 1.5mm (ReGe Roller System; Geosmatic Cosmeceuticals and Cosmocare, Pune, India) was rolled over the affected areas of the scalp after proper cleansing in all directions (longitudinal, vertical, and diagonal) until pinpoint bleeding was noted, which was considered as the end point of the procedure. All patients were instructed not to apply minoxidil on the day of procedure and to resume its application 24h thereafter. The patients were also instructed to apply minoxidil on a clean and dry scalp and not to use hair oil. The patients in both the groups were followed weekly for 12 weeks. During each visit, the findings related to treatment response such as decrease in hair fall, appearance of new hair, and patients’ general perception regarding the treatment were recorded. Any adverse effects related to therapy were also recorded. At the end of 12 weeks, the final response was evaluated. Patients of both the groups were asked to mark their perception regarding hair growth on a 10-inch long visual analog scale (VAS) of 0–10 (0, no improvement; 1, 10% improvement; 2, 20% improvement; 3, 30% improvement; 4, 40% improvement; 5, 50% improvement; 6, 60% improvement, 7, 70% improvement; 8, 80% improvement; 9, 90% improvement; and 10, 100% improvement). The results were tabulated on the Statistical package for the social sciences (SPSS, IBM Corporation) software using paired and unpaired t-test, Wilcoxon matched pairs test, Mann–Whitney U test, chi-square test, and their significance was evaluated. Sixty among the 68 recruited patients completed the treatment duration of 12 weeks. Three patients in the “microneedling plus topical minoxidil” group and five patients in the “minoxidil alone” group were lost to follow-up, and they were not considered for efficacy evaluation. Hence, 31 patients in the “microneedling plus topical minoxidil” and 29 patients in the “minoxidil alone” group were considered for efficacy evaluation. 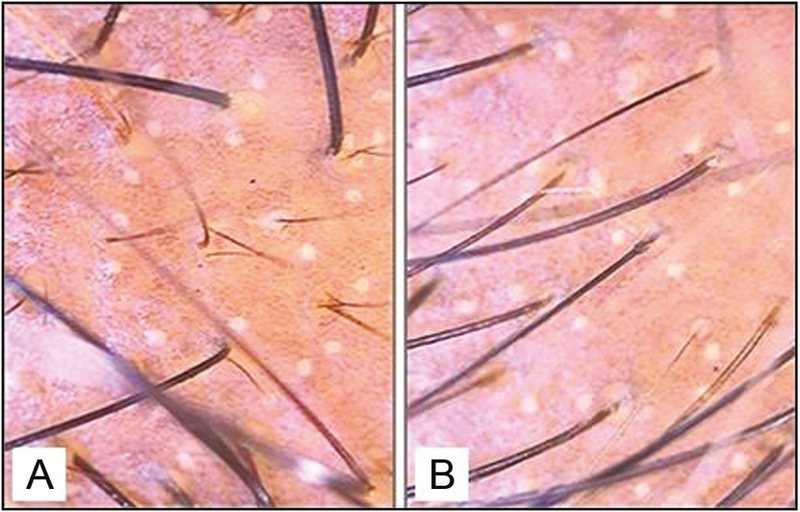 At the end of the study period, although global improvement in hair density was observed in both the groups on pre- and posttreatment photographic analysis [Figure 2] and [Figure 3], the patients in the combination treatment group showed considerable increase in the hair count on trichoscopic analysis [Figure 4] and [Figure 5]. The mean age of the patients in “microneedling plus topical minoxidil” group and “minoxidil alone” group was 27.53 and 24.56 years, respectively. The mean age of onset of hair loss in the “microneedling plus topical minoxidil” group and the “minoxidil alone” group was 23.56 and 21.71 years, respectively. The duration of hair loss of the patients enrolled in both the groups ranged from 6 months to 10 years. The mean duration of hair loss in the “microneedling plus topical minoxidil” group was 49.62 months, and in the “minoxidil alone” group was 31.71 months. The duration of hair loss in maximum number of patients in both the groups was less than 1.8 years. History of receiving treatment in the past for AGA was reported in 21 patients. Most prevalent type of AGA was Norwood–Hamilton grade IV in 22 of 68 patients. In the “microneedling plus topical minoxidil” group, 11 had grade IV hair loss, followed by grade IIIv (vertex) type in 7, grade IVa (anterior) in 6, and grade III and IIIa (anterior) type in 5 patients each. Similarly in the “minoxidil alone” group, 11 had grade IV hair loss, followed by grade III type in 8, grade IIIv (vertex) in 6, grade IIIa type in 5, and grade IVa in 4 patients. In the “microneedling plus topical minoxidil” group, maximum improvement in hair growth reported was 50%, which was observed in 4 (12.9%) patients, whereas no improvement was expressed by the patients in “minoxidil alone” group. The patient self-assessment of hair growth (mean ± standard deviation [SD]) at the end of 12 weeks on VAS was 2.97±1.28 and 1.21±0.90 in the “microneedling plus topical minoxidil” and “minoxidil alone” groups, respectively, which was statistically significant (P < 0.0001) [Table 1] and [Table 2]. All subjects of the “microneedling plus topical minoxidil” group showed an increase in target area hair count over 12 weeks, whereas 7 (24.1%) patients in the “minoxidil alone” group did not show any increase in hair count. The mean increase in hair count at week 12 was significantly greater for the “microneedling plus topical minoxidil” group compared to that for the “minoxidil alone” group (12.82 vs. 1.89 [P < 0.0001]) [Table 3], [Table 4], [Table 5], [Figure 4] and [Figure 5]. Increase in hair count was not statistically significant in subjects who received treatment in the past compared to that in the patients who did not receive treatment in either of the groups. Therapy-related side effects noted in the “microneedling plus topical minoxidil” group were mild pain and discomfort during the procedure, which were well tolerated by all patients. No side effects were reported by the “minoxidil alone” group. The patients in both the groups were advised to continue topical minoxidil after completion of the study period and were advised monthly follow-up. Various modalities of treatment have been proposed and used for AGA. No treatment modality is curative. Hair growth is achieved only on long-term treatment by various medical modalities of therapy and is not maintained after treatment discontinuation. The efficacy of any modality of treatment varies depending on the age of the patient, grade of hair loss, and compliance with treatment. As per various studies, men with AGA using minoxidil monotherapy continued to go bald despite being on therapy. Release of platelet-derived growth factors and epidermal growth factors through platelet activation and skin wound regeneration mechanisms, respectively. Activation of stem cells in the hair bulge area under wound-healing conditions. Overexpression of growth-related genes, vascular endothelial growth factor, β catenin, Wnt3a, and Wnt10b. 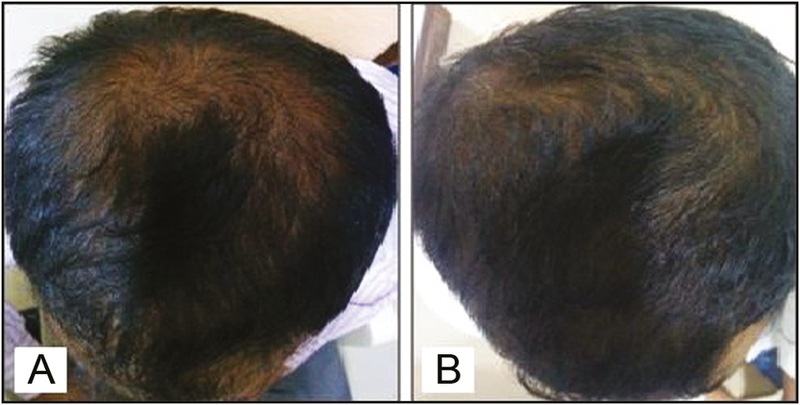 Scalp shaving was made compulsory for all the patients before the procedure in a study by Dhurat et al. We have modified our methodology by not making scalp shaving compulsory for the procedure so that more patients can be included in the study. Dhurat et al. observed more than 50% improvement in 41 (82%) patients of microneedling group versus only 2 (4.5%) in the minoxidil group on patient self-assessment of hair growth at week 12, whereas only 4 (12.9%) of our patients in the combination treatment group reported 50% improvement. None of our patients in the “minoxidil alone” group reported more than 30% improvement. The mean increase in hair count at week 12 was significantly greater for the microneedling group compared to that for the minoxidil group (91.4 vs. 22.2, P = 0.039) as observed by Dhurat et al. In our study, the mean (±SD) increase in hair count at the end of 12 weeks was 12.51 (±6.82) in the “microneedling with topical minoxidil” group and 1.89 (±8.94) in the “minoxidil alone” group, which was statistically significant (P < 0.0001). Even though the change in hair count from baseline at week 12 is statistically significant in our study, it is much less compared to that observed by Dhurat et al. [Table 6]. Twelve men, unsatisfied with finasteride and minoxidil, showed improvement with microneedling in the study by Dhurat et al., whereas no such findings were recorded in our study. From the above discussion, it is evident that microneedling is an effective, safe, and promising therapeutic modality for the treatment of AGA along with topical minoxidil 5% solution. However, the therapeutic response recorded in our “microneedling with topical minoxidil” group of patients, though statistically superior to the response in the “minoxidil alone” group, is not cosmetically significant when compared to the results of the study by Dhurat et al. Most plausible reasons for this finding may be due to the difference in the procedures adopted for evaluating the increase in hair count and also by not making scalp shaving compulsory for our study subjects. However, the sample size is small and the follow-up period is short in both the studies. Though the response achieved by microneedling in hair growth in our patients is significant, it was further preserved only on continuous use of minoxidil even after the study period. This finding is similar to conventional modalities of treatment where continuous long-term treatment is required to maintain the response. The results of this study did not establish “microneedling combined with minoxidil” as a unique therapeutic modality for AGA in men. This could be possibly because of the low sample size and limited duration of our study. We recommend further studies with larger sample size and appropriate follow-up assessment. Shanshanwal SJ, Dhurat RS. Superiority of dutasteride over finasteride in hair regrowth and reversal of miniaturization in men with androgenetic alopecia: a randomized controlled open-label, evaluator-blinded study. Indian J Dermatol Venereol Leprol 2017;83:47-54. Kwack MH, Sung YK, Chung EJ, Im SU, Ahn JS, Kim MK, et al. Dihydrotestosterone-inducible dickkopf 1 from balding dermal papilla cells causes apoptosis in follicular keratinocytes. J Invest Dermatol 2008;128:262-9. Randall VA, Thornton MJ, Hamada K, Messenger AG. Mechanism of androgen action in cultured dermal papilla cells derived from human hair follicles with varying responses to androgens in vivo. J Invest Dermatol 1992;98:86S-91S. Singh A, Yadav S. Microneedling: advances and widening horizons. Indian Dermatol Online J 2016;7:244-54. Jeong K, Lee YJ, Kim JE, Park YM, Kim BJ, Kang H. Repeated microneedle stimulation induce the enhanced expression of hair growth related genes. Ann Dermatol 2016;28:586-92. Kim BJ, Lim YY, Kim HM, Lee YW, Won CH, Huh CH, et al. Hair follicle regeneration in mice after wounding by microneedle roller. Int J Trichol 2012;4:117-30. Zimber MP, Ziering C, Zeigler F, Hubka M, Mansbridge JN, Baumgartner M, et al. 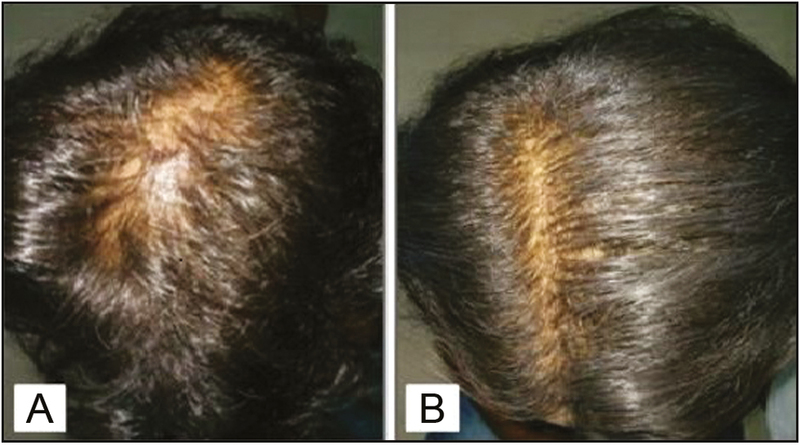 Hair regrowth following a wnt- and follistatin containing treatment: safety and efficacy in a first-in-man phase 1 clinical trial. J Drugs Dermatol 2011;10:1308-12. Messenger AG, Rundegren J. Minoxidil: mechanisms of action on hair growth. Br J Dermatol 2004;150:186-94. Kwack MH, Kang BM, Kim MK, Kim JC, Sung YK. Minoxidil activates β-catenin pathway in human dermal papilla cells: a possible explanation for its anagen prolongation effect. J Dermatol Sci 2011;62:154-9.